What happens when the previous title holder for "the world's hottest pepper", "Jolokia," gets dethroned by a new king? 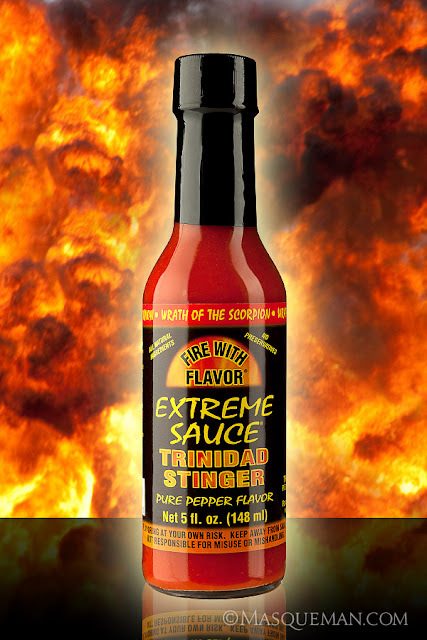 A special hot sauce is made from it to delight those with a daring sense of adventure. I am told that the Trinidad Moruga Scorpion pepper is likely to leave an impression since some specimens have measured over 2,000,000 on the Scoville heat scale. For comparison, Tabasco Sauce is rated at no more than 5,000. Extreme caution and common sense is a good idea, unless you want to burn your taste buds clean off. These pepers are locally grown in Georgia and packaged fresh so none of the potency is lost. If you are brave enough to try "Scorpion", then visit the Extreme Gourmet web site. You have been warned. This product photo was taken with a soft box and strip box to control the reflection shape. Flames were added later from some explosions I photographed... What, do you think I wanted to burn the building down?